Dan Levy over at B/R just posted some great thoughts on the pinnacle of honors in the sports world: namely, getting a playing surface to bear your name. With Dicky V getting the nod for the University of Detroit basketball floor, Levy shows that he's much better at Photoshop than we are, but it also got us thinking about the honors for the different venues at BC's campus. Don't forget that the hockey and basketball team, while they play in the same building, do technically have different venues. The building is named for Silvio O. Conte, BC Double Eagle and US Senator, but the hockey rink itself is named for the legendary coach John "Snooks" Kelley, who led the Eagles to a 1949 Ice Hockey championship, five of the first 10 Beanpots and hundreds of wins over his 35 year career on the Heights. Perhaps the only argument with the honor: where do you put BC's other legendary hockey coach's name when he finally hangs up the clipboard*. Jerry York Ice at Kelley Rink? To this date, I see no case, whatsoever, for a court-naming at BC. If I talk about Skinner, I'll punch myself for even thinking it (that national coach of the year award is a long, distant and fading memory of luck that completely was undone in the last few years when he gave up). We're not touching Jim O'Brien with a 15-foot pole. Bob Cousy wasn't around long enough (117-38 in six years) and no one would primarily associate him with the Eagles. Steve Donahue: you have an open window here. Just hang around for a decade or two more, maybe get into a few Final Fours and win the ACC half a dozen times. Then we'll talk. Not a moment before. Which brings us to the most obvious argument ever. If GDF needs one more Hail Mary to distract everything he's bungled over the last few years, I would in no way, shape or form be surprised if he chose to take a specific route. Flutie Field at Alumni Stadium. It's going to happen. Flutie hasn't seen the field since last playing with the Patriots in 2005, and while he did some time with ESPN, it's much more likely to see him in the Plex playing pick-up these days. We are now a little less than three years away from the 30th anniversary of November 23, 1984 and the anniversary of Flutie's Heisman winning season. 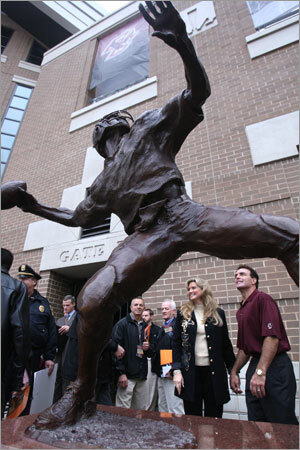 Flutie will be 52. It'll be the right time. Alumni Stadium is a lame name to begin with. It should just be called "The Heights".